Rising corporate star Reeva Rai is offered a prestigious position in a top-notch PR agency. It is the opportunity of a lifetime. But working with Enigmatic Billionaire Kunaal Kabi was not going to be easy. Even as she develops feelings for him, she is determined to prove herself. But when an activist friend turns to her for help with a real-estate scam, Reeva has to make a high-stakes choice. Can she retain the credibility of her prominent clients while helping hundreds save their homes? As she digs deeper to find solutions, a nefarious scheme unravels with unexpected connections. A no-holds-barred race ensues, blood is drawn and Reeva is trapped in the eye of a political thunderstorm. If she succeeds, powerful people will have much to answer. When I picked this book up, it was because the blurb sounded interesting. That said, I was still a little hesitant to read the book because I haven’t really enjoyed a lot of contemporary Indian fiction. Trust Me Not changes it all. This book was to say the least, enthralling. Gripping on the edge of your thrillers are the best and this book was exactly that. 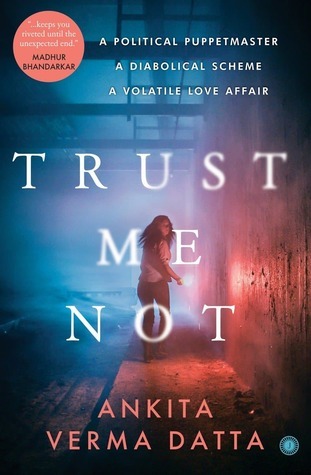 Trust Me Not by Ankita Verma Datta stars Reeva Rai, a professional, ambitious and independent twenty-seven year old woman. She knows what she wants and knows how to get it too. Like any woman in her late-twenties, Reeva too is being pressured by her mother to get married. Coincidentally, Reeva meets Kunaal Kabi, an enigmatic billionaire and soon sparks fly. To add some twist to the tale, Kunaal soon becomes Reeva’s boss at the company she works. While Kunaal and Reeva’s chemistry is quite prominent, I enjoyed the thriller aspect of the book a lot more. Kunaal and Reeva are handling the PR for a political party JBP when suddenly the party is hit with controversies. It’s up to the lead duo to make sure that the party maintains their clean image and comes out victorious in the elections. One of the best things about this book was the multiple layers to all the characters. None of them were one-dimensional, which added to the intrigue and development of the story. There are a lot of secondary characters in the book. What’s interesting is that almost every character has a hidden truth to them, truths that change the course of Reeva’s life and beliefs as well as the course of the story. Even though I felt that the story dragged a bit at some places, Trust Me Not is one of the best political thrillers I have read in a very long time. The added angle of romance was like the cherry on top for me. I would urge every thriller lover to give this book a chance. You won’t be disappointed and that’s a guarantee. Thank you Writersmelon for a review copy.